Time sheets are a necessary part of our daily working life. Time sheets are of various types, and each of them has different application. There are time sheets for attendance which are the most common for any working place or educational institute. Sometimes sheets are used to keep track of driving time, overtime and claim the pay for those activities from the employer. 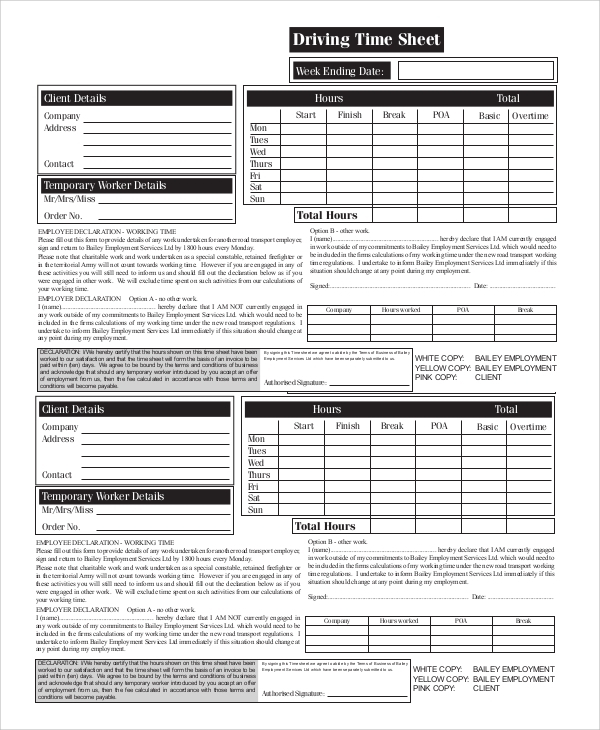 They following printable Time Worksheet Samples are professional in design and every individual and working organization needs them. This is a printable driving time sheet. It is useful for someone who has put a car on rent or for employees to claim the money during salary by furnishing a proper driving time sheet. It has provisions to write client details, temporary worker details and the hourly time spent in driving. 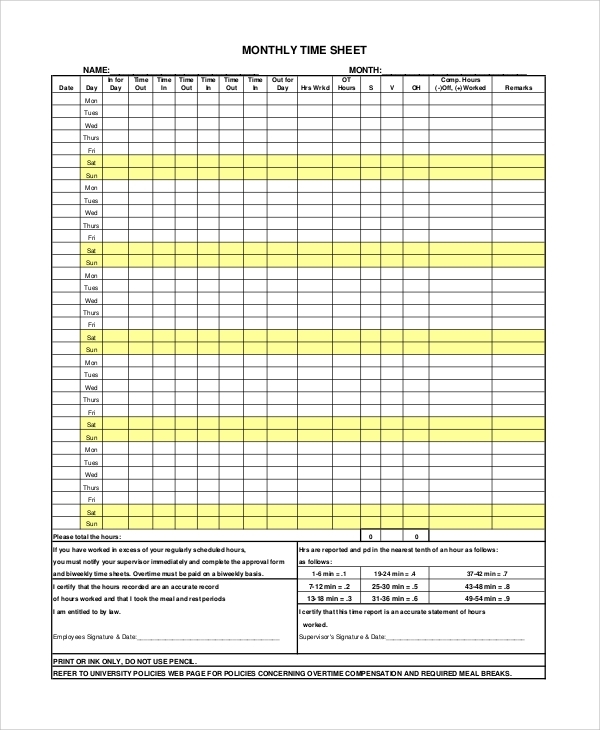 This is a printable driving time sheet can be used to track the hours that the workers have worked. Working time includes all time that a worker must be at a specific place or does work for the employer. 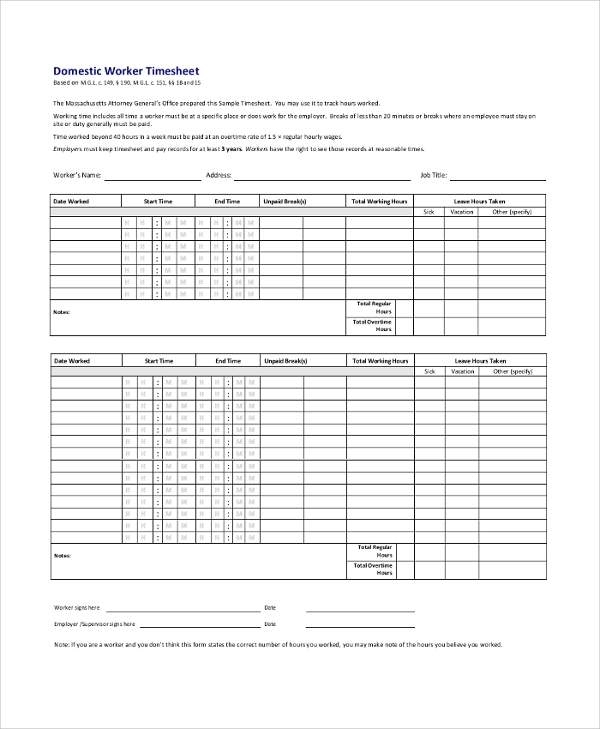 You can use this sample for creating your daily worker timesheet and it is print-ready as well. 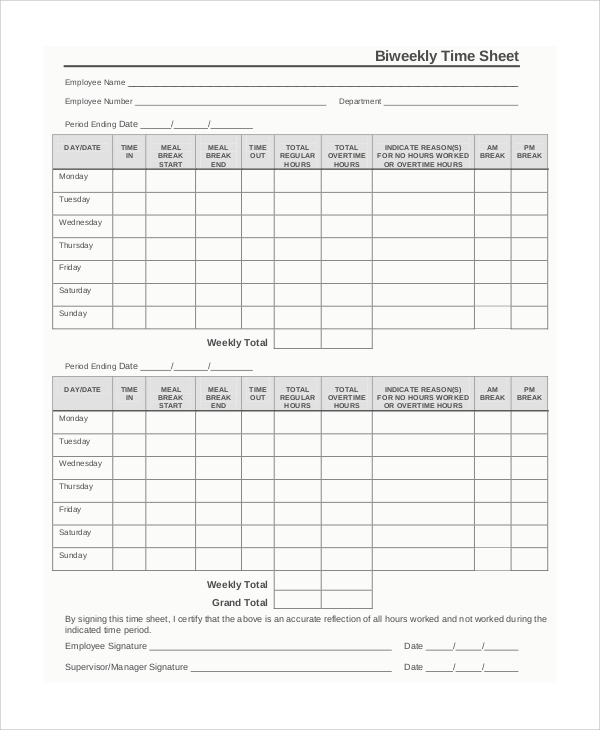 This is a printable time sheet for the employees to maintain the records of the daily work time. It is in tabular format, and there are provisions for writing regular and over time. It is needed in every working organization. Sometimes, salary is paid based on the hourly work. Time Sheets are very useful, and it helps to keep a record as well as to make the activities organized. It is immensely helpful in working organization to keep track of every employee and their activities and pay them accordingly. There are timesheets to keep track of volunteers’ activities. There are time sheets in different ranges like hourly, daily, weekly, bi-weekly, monthly quarterly and annually. There are time sheets for employees, workers, students, teachers, and every other working members. This is an amazing format for Sample Attendance Sheets in Excel. It is printable and editable. It has all the necessary provisions for keeping records of leaves taken, overtime, working hours in educational institutes and working places. 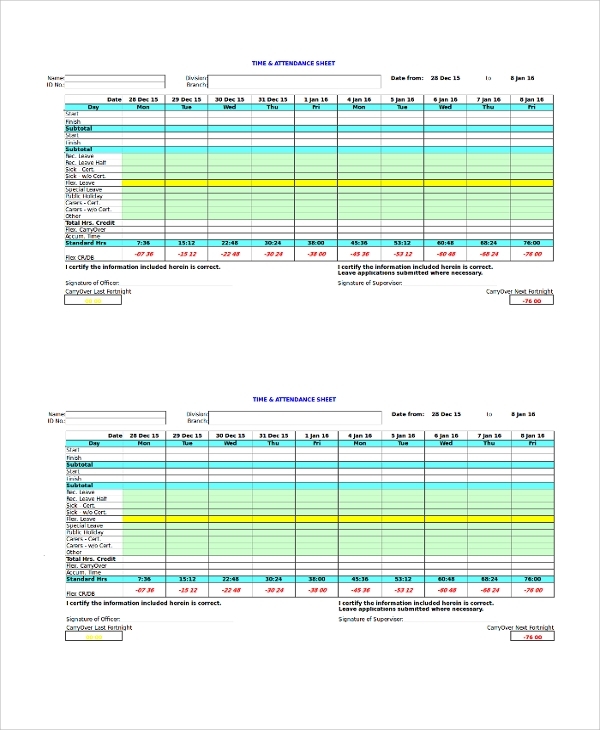 This is Sample Excel Timesheets to maintain the volunteer time spent by individual students. 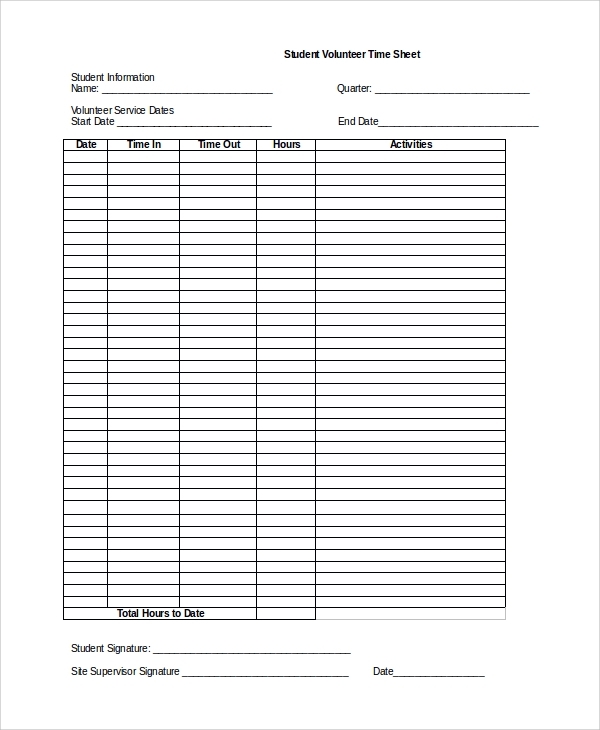 It contains fields to fill in student information followed by a tabular format for writing time in and time out and activities performed. 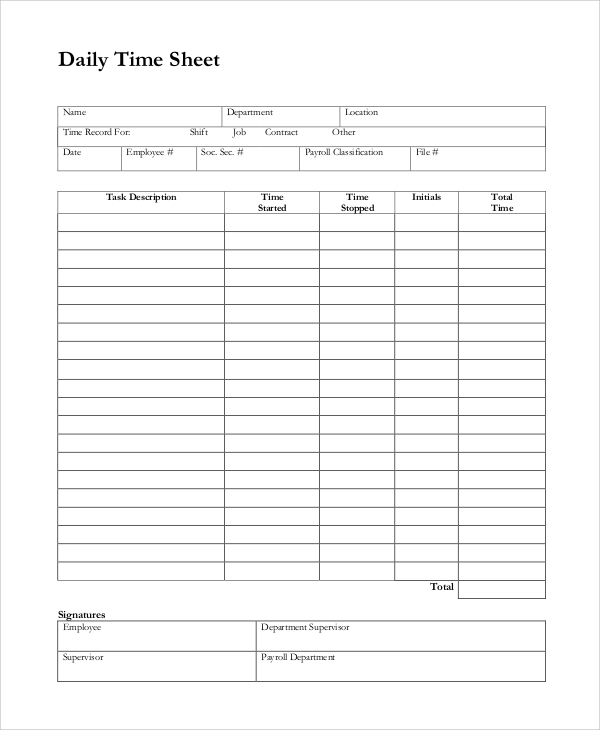 This hourly time sheet can be printed or used digitally as well. It is highly useful for an organization where pay is based on the hours of working. It is also useful for part-timers and regular employees. The targeted audiences for the timesheets are all the companies and their employees. As a matter of fact, any working organization including educational institutes need them every day. 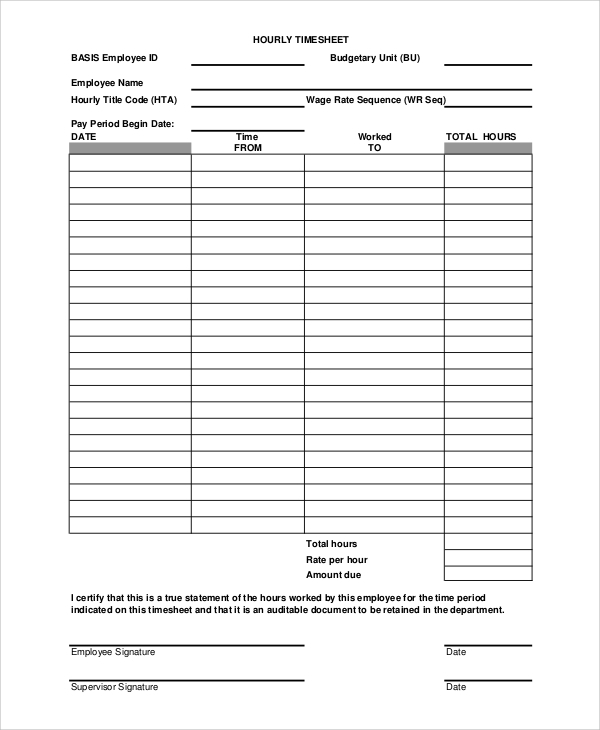 There are attendance time sheets to determine the working time of individual employees. There are Sample Payroll Timesheets for companies where employees are paid on an hourly work basis. Sometimes sheets are used to keep track of driving time and get paid for the hours whether it is touring a client or for a car rental service. The above-listed Sample Blank Timesheets are professional in design and have all the necessary provisions to keep records of the individual employee. Apart from regular employees, it is far more useful for employees who get paid on the number of hours worked or even for part-time employees. There are sample excel timesheets which are editable and new fields and rows can be inserted as per requirements.